HYVINKÄÄ (Finland), 14 July 2013 – The sun was out to host the main races of the Finish Grand Prix at the historical and emblematic track of Hyvinkää, but even if the rain came by the end of the final race, it did not stop the MX1 riders to give a great show to the Finnish fans. Former Finnish World Champions Heikki Mikkola and Pekka Venkonen did not want to miss the comeback of Hyvikää to the FIM Motocross World Championship and they could witness how Antonio Cairoli and Jeffrey Herlings dominated the MX1 and MX2 classes. Click here for some video footage. Clement Desalle and Kevin Strijbos completed the MX1 podium, while Dean Ferris and Jordi Tixier were second and third in MX2. Before the MX1 and MX2 main races, the EMX250 European riders took part in their Final race and Mike Kras obteined his maiden victory in the European Championship. Valentin Guillod, who keeps on leading the series, was second and Brent Van Doninck was third. Red Bull KTM Factory Racing’s Antonio Cairoli obtained his 62nd overall victory today after winning both races of the Finnish Grand Prix. In the first race the Italian started fourth behind Clement Desalle, Rui Gonçalves and Kevin Strijbos, but he quickly moved up to second and tried to catch the Belgian rider. Cairoli admitted that it took him a while to find the good lines and reach the good speed, but in the end he passed him and crossed the finish line six seconds ahead of the Belgian rider. In the second race things were much easier for Cairoli, as he was able to take the lead in the first lap and he dominated the race with great authority until the chequered flag. Rockstar Energy Suzuki World Clement Desalle was very satisfied with his riding today, as well as with his starts. The Belgian rider obtained his maiden Get Athena holeshot in the first heat and he dominated it until Cairoli overtook him. Desalle was determined to win the second race, but his third position in the second moto made him finish on the second step of the podium. Third overall was his teammate Kevin Strijbos who had one of the best weekends of the season. The Belgian rider had a good qualifying race yesterday and today he managed to take two good starts and kept the rhythm of the front group. Strijbos admitted that by the middle of the first race he had a little bit of arm pump and he moved from third to fifth, but in the second race the Belgian was fully motivated and his second position made him obtain the second podium of the season. Red Bull KTM Factory Racing’s Ken De Dycker missed the podium this weekend, but he was able to finish fourth overall even if he did not have a really good gate pick due to his twelfth position in yesterday’s qualifying race. The Belgian had two poor starts in both races, but he was able to make two strong recoveries; in the first race he moved from 13th to an incredible third place, whereas in the second heat he had to settle down with the sixth place after starting also around the 13th position. Kawasaki Racing Team’s Jeremy Van Horebeek was really close again to finish on the podium, but in the end he finished fifth overall just one point behind De Dycker. In the first race he started sixth but after two laps he was already riding third behind Strijbos. The Kawasaki Racing Team rider was trying to overtake his compatriot when De Dycker came from behind and passed him. By the end of the race Van Horebeek was able to overtake Strijbos and he crossed the finish line in fourth. In the second race he had a poor start, but once again he moved up really quickly and after five laps he was riding fifth. Van Horebeek moved up one position when Tommy Searle had to enter the pit lane to change his goggles, but with two laps to go Gautier Paulin overtook him, so the Belgian finished fifth. It was not a good weekend for Gautier Paulin who obtained an overall sixth place in Finland after finishing 6-4 in today’s races. The French rider did not have good starts and he admitted that he struggled to find the good lines to move up to the front positions. Instead, Rui Gonçalves started with the front riders in both heats, but he could not keep the rhythm of his rivals and his eighth and seventh places made him finish seventh overall in the Grand Prix. 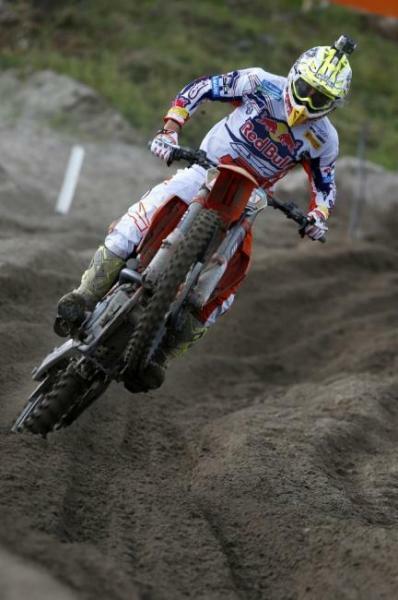 Evgeny Bobryshev and Max Nagl were eighth and ninth, and Joel Roelants completed the top ten. Tommy Searle crashed in the second corner of the first race with Jonathan Barragán and he had to work really hard to move from almost the last position until his final twelfth place. In the second race the British rider started around the tenth place and after four laps he was already riding in fourth. After such an incredible recovery, Searle gave chase to Desalle and both riders exchanged positions a couple of times. In the end Desalle attempted a hard move that resulted in the Briton hitting the floor and the intense duel was over. Searle had to enter the pitlane to change his goggles and he crossed the finish line eleventh. The best Finnish rider was Ludvig Söderberg in the twenty-first position. Red Bull KTM Factory Racing’s Jeffrey Herlings had no rival today and once he managed to take the lead in the early stages of both heats, he pulled away and crossed the finish line with more than fifty seconds advantage over the second rider. The Dutch rider was very satisfied with his riding but he was even happier for having obtained his twelfth Grand Prix victory, as he is now on par with Stefan Evert’s record. The second overall position was for Monster Energy Yamaha’s Dean Ferris, whose last podium was in Portugal during the sixth Grand Prix of the season. The Australian rider explained that he felt really well in the track this weekend and this is why he was able to take two good starts and ride two consistent motos. Ferris finished third in both races. Red Bull KTM Factory Racing’s Jordi Tixier crashed in the first lap of the first race and he had to push really hard to move from almost the last position until the fifth place. The French rider had made such a big effort that he hardly had energies to take part in the second race, but once again Tixier did an excellent performance and he rode a solid race in second. Tixier was happy with his third overall position, but he will now do his best to focus on his first races and try to finish on the second or even first step of the podium in the Grand Prix to come. Silver Action KTM’s José Butrón was only fourth this weekend but he was very satisfied with his result, as he is aware that he is not a sand specialist. In the first race Butrón started ninth and after a few laps he ran out of tear-off and he did not feel very comfortable from then onwards. Butrón decided to keep on racing without taking many risks and he crossed the finish line in the ninth position. In the second race he started third and he obtained a strong fourth place which made him finish fourth overall. JTECH ESTA Motorsports Racing Honda’s Alexandr Tonkov finished fifth overall thanks to his 10-6 result. In the first race the Russian started around the seventh place, but he struggled to find the good lines and Ferrandis and Kullas overtook him by the middle of the race. Tonkov kept on having some problems and dropped down two positions more with Butrón and Tixier. In the second race the Russian had another good start and this time he rode a consistent race in sixth. Home rider Harri Kullas managed to fulfil his goal for the weekend by finishing sixth overall in front of his home crowd. The Finnish rider had a really good start in the first race and he battled with Tonkov, Ferrandis and Butrón for the sixth position during several laps. In the end he crossed the finish line in seventh and in the second race obtained a consistent tenth position after starting down in eleventh. Petar Petrov was riding again among the best MX2 riders and this weekend he finished seventh overall thanks to his 6-11 result. 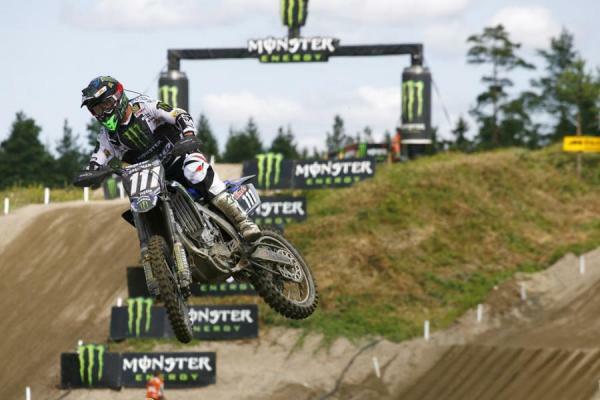 Max Anstie obtained a solid seventh position in the second race, but his eleventh result in the first heat made him finish eighth overall. However, this result gives some extra motivation to the British rider to do well in the races to come. Glenn Coldenhoff was once again very unlucky this weekend; yesterday he won the qualifying race and today he obtained the Get Athena Holeshot in the first race and he managed to finish second. However, the Dutch rider crashed in the start of the second race and some laps afterwards his KTM stopped. Coldenhoff was very disappointed, as he was very motivated to finish on the podium this weekend and he was only able to finish ninth overall. Christophe Charlier and Jake Nicholls were also involved in the crash at the start of the second race and they were only able to finish thirteenth and nineteenth respectively. In the first race, Charlier had finished eighth and Nicholls had obtained a strong fourth position, so the French and the British rider ended tenth and eleventh in the Grand Prix. Romain Febvre, who had finished third in yesterday’s qualifying race, had a really good start in the first race, but he was forced to retire while he was riding fourth due to a problem in the gearbox of his KTM. In the second race the French rider obtained a strong fifth place, which gave him the final thirteenth position. Alessandro Lupino crashed in the first race and was only able to finish eighteenth, and in the second heat he ended ninth to finish fourteenth in the Grand Prix, ahead of Dylan Ferrandis. The French rider also crashed in the first race while he was fifth, but Kullas landed on his bike and Ferrandis was forced to retire because his Kawasaki was too damaged. In the second race he obtained a strong eighth position. Hyvinkää was an unseen test for most of the FIM Motocross World Championship paddock, but when the Grand Prix community rolled into the venue on Friday and saw the compact and sandy terrain there was a sense of inevitability about this twelfth round of seventeen. And so it came to pass. For the eighth time this season a sandy education was dolled out by the Red Bull KTM duo of Tony Cairoli and Jeffrey Herlings in the MX1 and MX2 classes as they both walked the top steps of the podium. It was the third occasion in which they swept both motos together and now brings the duo within touching distance of their title renewals…with five rounds still to go. 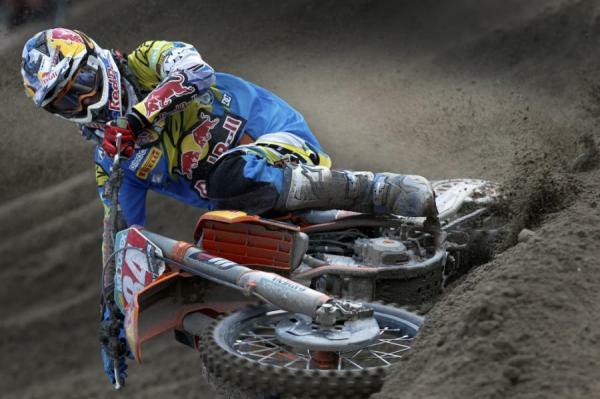 For Herlings, especially, this was a sweet victory. 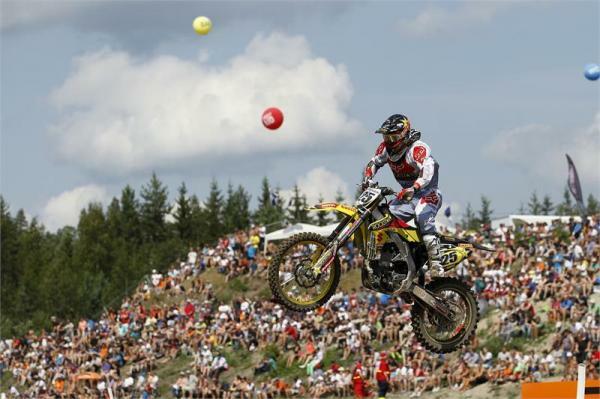 His twelfth in a row drew him level with the record set by team manager Stefan Everts in 2006. The eighteen year old Dutchman reached 28 wins for his career and by beating Monster Energy Yamaha’s Dean Ferris and teammate Jordi Tixier established a 151 point lead in MX2, meaning he can be champion again in three weeks at the Grand Prix of Czech Republic. Cairoli went 1-1 to capture the MX1 overall in Finland. Hyvinkää drew a chorus of moans on Saturday with the riders united in their criticism that the flat layout was too short with 1 minute 30 second lap-times. In truth this was unfair. Although Finland’s Harri Kullas – a rider battling to come back from knee ligament injury and once the young starlet of MX2 in 2010 – said the course used to last two minutes until it had to be reshaped to fit the Grand Prix infrastructure. Hyvinkää was similar to Mantova in Italy. In other words a very tight, level circuit with shallow spectator banking on two sides that hemmed the racetrack inside. This was never a long Finnish “epic” to begin with. Hyvinkää had also stepped late into the void abandoned by Russia on the Grand Prix calendar in February, so it was also a slightly hurried event. Predictably the track became rougher, slower and harder and the complaints subsided on Sunday. This was an effective sandy stage for racing; difficult, physical and gave the riders options. The motos ended up being only two laps longer than usual. Herlings may draw the plaudits and glory for his sand ability (and the Dutchman was 55 and 51 seconds ahead of countryman and Standing Construct KTM’s Glen Coldhenhoff and Tixier at both times of asking) but Cairoli is equally as deft; as those watching the 2012 Motocross of Nations at Lommel will remember. The Sicilian stalked an impressive Clement Desalle – the Rockstar Energy Suzuki rider not renowned for his race-winning speed in the sand – in the first moto and overtook with a close and measured block pass to escape in the final seven laps. In the second race he led from the front and kept distance from Desalle’s teammate; the flighty Kevin Strijbos making the podium for the second time this season on the factory machine. Clement Desalle would finish second overall, but the headlines came from his dust up with Tommy Searle. Desalle finished second overall for his ninth podium from twelve in 2013 but he could have easily been penalized (and was officially reprimanded) for some overly aggressive moves on CLS Monster Energy Kawasaki Pro Circuit’s Tommy Searle. Their line-stealing and bar-banging for two laps deep into the moto was almost a headline grabber. Searle was electric after a charge through the top ten and passed Desalle for third position, a race that again marked him as a special rookie talent on the 450. He was held-up by backmarkers (a legible complaint by the lead riders on Sunday) which allowed Desalle to close and mix it up. Several heated encounters saw Searle already running off the track but the Suzuki man ended the dispute by driving the Briton into a high berm shortly after and putting him down. Cairoli was oblivious to this and with Kawasaki’s Gautier Paulin suffering poor starts and only able to classify sixth overall the Sicilian now has a 99 point lead, two Grands Prix effectively, meaning a party could be started at Bastogne in Belgium in the middle of August. Fair dues to Jeremy van Horebeek for another consistent run and a dependable speed in his first MX1 season that puts him just behind Desalle and possibly Searle in terms of the most sought after rider for 2014. Ken de Dycker was the source of bizarre rumors that he actually isn’t that satisfied with his new factory KTM contract and a poor getaway in the second moto prevented the tall Belgian from entering the podium ceremony for the third time in a row. Bad luck for 2011 world championship runner-up Steven Frossard as the misfortune and injury-cursed Frenchman smacked his foot while drilling the Monster Energy Yamaha in the Saturday heat race and broke another two metatarsal bones. Jeffrey Herlings marched to another 1-1 performance in Finland. In MX2 Herlings was busy lapping away but his Dutch compatriot Coldenhoff continues to grow in stature in the sand. Pole Position on Saturday and second in the first moto lined up his first overdue podium finish. Even a first corner crash in the second race didn't seem to be much of an impediment as he gained serious ground back from last to 12th before a mechanical frustratingly ended his day half way through the moto. Ferris capitalized on two bright starts to make good on his third rostrum appearance and the Australian’s enthusiasm on the box was refreshing alongside the KTM riders who now uncork champagne as a matter of routine. Worthy mention to Kullas, who fed off the home support for a confidence-surging sixth position overall and a result and could re-kickstart the career of one of the genuine nice guys in the paddock. Some flight problems in London and also big prices for the travel to arrive in Helsinki from the UK ultimately prevented Dean Wilson from travelling to the Grand Prix, just as rumors were escalating that the 2011 AMA champ might be considering a West Coast Lites and world championship ride for 2014. It remains to be seen whether the Scotsman will join the paddock and also if Tyla Rattray also fancies his first attempt at the MX1 class after claiming the MX2 crown back in 2008. The FIM series has chalked off two thirds of the 2013 fixtures and events in Germany, Czech Republic, Belgium, Great Britain and Holland remain. Dean Ferris used good starts to capture his third MX2 podium on the season.